James Edward Franco (born April 19, 1978) is an American movie, television, stage, voice actor, movie producer, screenwriter, and movie director who is known for his roles in 127 Hours, Rise of the Planet of the Apes, Your Highness, Spider-Man, Spider-Man 2, Spider-Man 3 (alongside Tobey Maguire), Oz the Great and Powerful, This Is the End, The Interview, The Little Prince, Sausage Party, Why Him? and will star as Tommy Wiseau in The Disaster Artist. He won an Golden Globe Award in 2001. 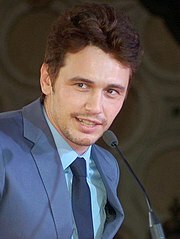 Franco was born on April 19, 1978 in Palo Alto, California. He studied at the Palo Alto High School and at University of California, Los Angeles. ↑ "James Franco Biography". Yahoo!. Retrieved August 8, 2008. This page was last changed on 8 April 2019, at 21:53.